Besides visiting one’s bank account, there are many more prosaic, but equally pleasurable, reasons to visit Zurich. This February, the city celebrates a hundred years of Dadaism alongside the bi-annual arts festival Manifesta in June. All the better enjoyed while ensconced in the spruced up Marktgasse Hotel. 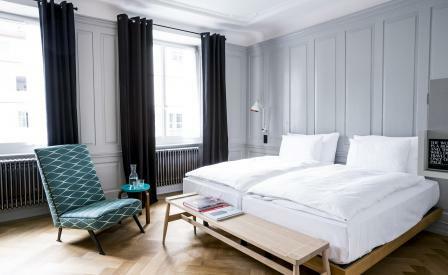 Basel-based firm Miller & Maranta, and interior designers Kessler & Kessler and IDA 14 have turned one of the city’s oldest inns – really, two ancient buildings dating back to 1291 – into a sleekly modern 39-room bolthole. The two-year project is a pleasing amalgam of restoration and renovation where original features such as stucco work, wall panelling and columns are neatly balanced by Nordic minimalism and Italian flourishes by way of Flos lamps and Cassina and Vitra furniture. In-house bar Baltho, wrapped in dark greens and stained woods, serves a mix of local small brew beers and cocktails infused with natural botanicals, while the adjoining restaurant makes a striking statement with its Stefan Burger installation and ethereal polygonal wired lamps. A combination of space and the engineering logistics of a spa and gym must have proved too much of a challenge – guests are directed to a gym and a luxe hammam complete with herbal steams and lather room a two minute walk down the road.